Winter driving in Gallatin County can be a scary, nerve-wracking, or flat out dreaded experience for some. And since here in Montana, we are bound to have many days of extreme winter driving conditions, we might as well learn to make the best of it. As winter gets into full swing, we’ve compiled some of the the best words of advice we could find to keep you safe and prepared for the inevitable icy, wet, or snowy roads. Smart driving is safer driving during any season, but a little extra knowledge goes a long way to keep yourself, your passengers, and other drivers safe throughout Montana’s long winters. Consider changing current performance or even all-season tires to winter tires. 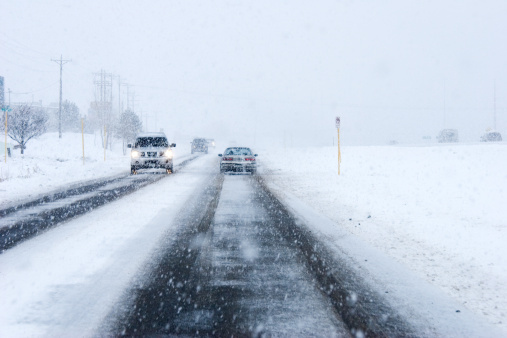 Make sure tires are inflated properly before driving on icy, snowy, or wet roads. Use a tire gauge to ensure tires are inflated to the proper pounds per square inch (PSI). The correct PSI for a cold tire is located on the tire itself, noted by the manufacturer. Check your tires for signs of wear by checking tread depth. Tire treat is considered worn when the depth is 1/16 of an inch or less. To determine, place a penny head-side down at various locations on the tread. If the top of President Lincoln’s head is visible, or not covered by the tread, it is worn and the tire should be replaced. Check windshield wipers, and replace if damaged. Change windshield wiper fluid to a winter mix that contains a de-icer. Weak batteries should be replaced. Cold weather is harsh on batteries, especially in those vehicles that are parked outdoors. Check radiator to ensure proper amount of antifreeze. Half antifreeze, half water mix is ideal for the car’s performance. Before you drive anywhere in the winter, check the weather and road reports to see if roads are icy, wet, or snow-covered. To find these links, check out our Weather page here: http://healthygallatin.org/healthy-homes/weather/. If you can’t avoid driving, and the roads are icy or snowy, make sure to follow ALL of these steps to keep yourself, your passengers, and other drivers safe on the road. Leave yourself plenty of time to reach your destination, and leave earlier than you would on a regular, snow-free or ice-free day. Drive slower than the posted speed limit. Posted speed limits are meant for clear, dry roads, and are not optimal for icy, snowy, or wet roads. Higher speeds will increase risk of hydroplaning or sliding. Leave yourself plenty of room to stop. You should allow at least three times more space than usual between you and the car in front of you. Remember, cars take longer to stop on slick roads. Begin braking sooner than usual. This way, if your car does start to slide, you will have more time to react, making it more likely to avoid a collision with the person in front of you. Never use cruise control or overdrive on icy or wet roads. Do not leave your car unless you know exactly where you are, how far it is to possible help, and if are certain you will improve your situation. To protect yourself from frostbite and hypothermia use woolen items and blankets to keep warm. Be sure to replenish after use! Information from these lists is courtesy of www.weather.com , http://www.autobidmaster.com/articles/Winter-Weather-Tips-for-Cars/, and the Montana Disaster and Emergency Survival Guide here http://mdt.mt.gov/publications/docs/brochures/winter_maint/winter_survival.pdf. For more information about weather in Gallatin County, click here. For more information about Emergency Preparedness in Gallatin County, click here.